Android L is an upcoming release of the Android mobile operating system developed by Google. Unveiled on June 25, 2014, and released in a beta the next day for selected Google Nexus devices, it is expected to be released to manufacturing in late-2014. The most prominent changes to L include a redesigned user interface built around a responsive design language referred to as "material design", and improvements to the notification system which allow them to be accessed from the lock screen, and displayed within other apps as banners across the top of the screen. Internal changes were also made to the platform, with the Android Runtime officially replacing Dalvik for improved application performance, and changes intended to improve and optimize battery usage. 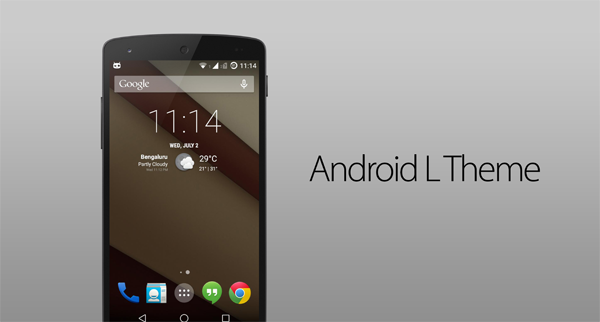 Android L was first unveiled on June 25, 2014 during a keynote presentation at the Google I/O developers' conference. Alongside L, the presentation focused on a number of new Android-oriented platforms and technologies, including Android TV, in-car platform Android Auto, wearable computing platform Android Wear, and health tracking platform Google Fit. It does not yet have a formal version number or codename.